Want to travel the world without leaving Vermont? 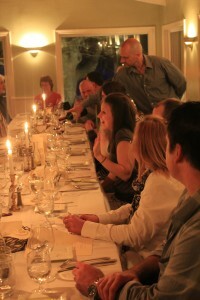 The Red Clover Inn’s March Wine Dinner features Wines of the World on Friday March 2, 2012. Each and every month we host a wine dinner featuring a unique menu with the freshest local Vermont ingredients created by Chef Dennis Vieira, designed to perfectly complement the featured wines. Can’t join us for Wines of the World? How about Spain (April 6, 2012)? Or South America (May 4, 2012)? Please feel free to check our schedule of upcoming wine events. Reservations are required: 802-775-2290. Wine event packages that include overnight stays and weekend getaways are also available. Copyright © 2019 Killington Year Round - All Rights Reserved - Note: KYR is not affiliated with any other Killington, Vt entity.